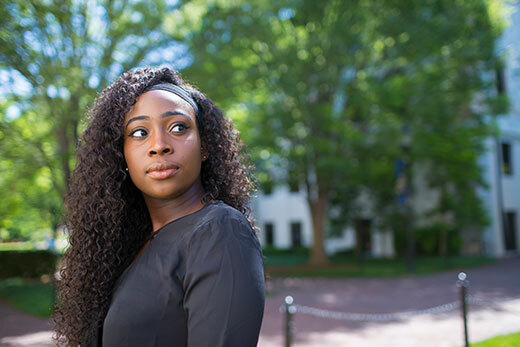 Glory James entered Emory College of Arts and Sciences certain that two things defined her: an identity as a Nigerian immigrant and her future in law school. That was before Black Lives Matter dominated the news, she conducted thorough research and discussions in her sociology and international studies double major and made time for lengthy conversations with fellow students and faculty. That compelling four-year experience in learning taught her that, though America’s history of racial discrimination was not her history, those injustices would shape her identity and future. James’ dedication to that hard work of listening, collaborating with students and faculty alike, will see her graduate with highest honors in May. She starts at Columbia Law School at Columbia University in the fall. James’ honors thesis stands out for its real-world implications. After a series of sociology courses that discussed cultural representations of identity in the media, she grew interested in how black and white women were portrayed in mainstream mass media. Her research focused on advertisements in Vogue, aimed mostly at white audiences, and Ebony, aimed mostly at black audiences. James read previous research from the 1970s to the present, examining some of the same questions. Her first challenge in conducting her own work was finding copies of both magazines from the same time period. She delved into collections at the Woodruff Library but also accessed to the library at the Atlanta University Center for physical copies of Ebony. In the end, she built a database of more than 500 images from both magazines between 2004 and 2008. From there, she applied standardized codes of the images, such as whether the models are scantily clad, whether they are in positions of subordination, and the location of the photo. James also added her own three codes that examined body type and characteristics, such as skin tone and hair type, which indicated European or African culture. Her findings showed ads in both magazines had evolved somewhat from those examined in the 1970s. For instance, modern ads depicted women in work environments and not just in the home. However, the recent ads still overwhelmingly showed women in subordinate roles to men. And while Ebony showed more black women in their ads, with more diversity among the models, both magazines favored black models with European features, such as straightened hair and light skin. James was influenced at Emory by her coursework and also by the very community she helped create. Her commitment to service and meeting as many fellow students as possible led her to work in Residence Life and as a volunteer tutor in the Emory Writing Center. In Residence Life, she worked as a sophomore adviser and resident adviser at Longstreet-Means Hall, the global cultures hall. Now a senior RA at Harris, she still seeks out students to talk with, both to mentor them and also learn their views. Des’Mon Taylor was new to Emory the first year James worked for him. Now her supervisor as complex director of Harris Hall, Taylor says he was amazed to watch James get energized by the talents, interests and viewpoints of other students, and manage to connect him and the students to their new home. James has long known she wanted to be an attorney, the ideal career to marry her analytical mind with her overwhelming curiosity about perspectives. A qualitative methods course helped her sharpen her focus on data and analysis, she says, while a study abroad trip to the United Kingdom gave her an example of how she hopes to approach law. Her research there involved interviewing Londoners about their thoughts on the National Health Service, in a bid to gauge satisfaction with the health care system compared to Americans’ views on our system.